Pregnancy and labor inevitably increase cardiac strain, and cardiac disease will further enhance this burden. Heart disease complicating pregnancy significantly increases the maternal and fetal morbidity and mortality. Normal pregnancies produce cardiorespiratory symptoms like palpitation, decreased exercise capacity, fatigue, hyperventilation, dyspnea, and ankle edema that can mimic cardiac disease or can unmask the underlying cardiac illness. Almost one-third of cardiac patients are found to be symptom-free preconceptionally and are diagnosed during routine antenatal checkups. When cardiac disease is diagnosed in early pregnancy, it is more accurate than in late pregnancy. As in later part of the pregnancy, it may be difficult to diagnose clinically because of physiologic and anatomical changes that occur in cardiovascular system, which may confuse the clinician. Early diagnosis leads to early intervention and suitable management and appropriate advice to antenatal mothers, which leads to safe motherhood. Due to the changing hemodynamics of pregnancy, cardiovascular system is influenced both anatomically and physiologically by conception. Regarding anatomical alteration, enlarged uterus produces a more horizontal heart that mimics cardiac enlargement as apical impulse is shifted more to left and cephalad of its normal position because of enlarged uterus and upward pushing of diaphragm. The most important physiologic changes in cardiovascular system include rising cardiac output, rise in blood volume, and red cell mass. These changes begin to appear as early at 10th week and peak at 20th week of pregnancy. The heart rate increases by 10 to 15 beats/min, and it can be noted in the first trimester. Cardiac output increases by 30 to 50%, begins as early as fifth week of gestation with a peak usually at 20 to 24 weeks, and continues to increase up to 32 weeks of pregnancy after which it plateaus. After 32 weeks as the enlarging uterus compresses the inferior vena cava in supine position, there is decrease in preload due to decreased venous return and decrease in blood pressure. Even then, the cardiac output at term is significantly greater than the basal nonpregnant state. There is decrease in systemic blood pressure, total peripheral resistance, and pulmonary vascular resistance, which helps increase cardiac output and decrease blood pressure, especially the diastolic pressure leading to a wide pulse pressure. There is bounding pulse because of rise in blood volume. Sometimes there is collapsing pulse as is observed in aortic regurgitation. In early weeks of pregnancy, elevated stroke volume is the cause of increased cardiac output, but in late pregnancy, increased heart rate is the cause of high cardiac output. The increased pulmonary blood flow is balanced by a decrease in pulmonary vascular resistance with unchanged pulmonary artery pressure. Increased levels of estrogens, prostaglandins such as prostacyclins and local vasoactive agents such as nitric oxide are the chief mediators of the above hemodynamic changes in pregnancy. During labor, myometrial contractions cause an increase in cardiac output as uterine blood is squeezed into systemic circulation. Pain and anxiety lead to elevated stroke volume by increase in the sympathetic tone and heart rate. There is increase in blood volume in pregnancy by 50%. This increase is caused by 40 to 50% plasma volume expansion and, to a lesser extent, by red cell volume that increases by 30%. This leads to decrease in hematocrit with peak hemodilution that is seen at the end of the mid-trimester. This explains the physiologic anemia in pregnancy commonly evident at 34 weeks of gestation. The blood volume in a pregnant woman at a term is 100 mL/kg. The increase in red blood cell (RBC) volume starts as early as eight week of pregnancy and rises by 30% by the end of pregnancy, which is useful for increased oxygen demand by tissues. The lifespan of the red cell is slightly decreased in pregnancy. Erythropoietin levels increase by 50%, which is responsible for increased erythropoiesis and red cell volume. Regarding heart sounds, there is exaggerated split of the first sound because of increase in cardiac output that may be mistaken as S4 or as a systolic click. There is increased intensity of S2 leading to misinterpretation of loud P2 as seen in pulmonary hypertension or an atrial septal defect. Rarely a physiologic third heart sound can be present due to increased blood volume. There may be audible transparent systolic murmurs due to increased blood flow, which is commonly present at apex or left sternal border. They are usually soft murmurs and are midsystolic. Among the investigations for diagnosing cardiac illness during pregnancy, the noninvasive tests play a major role. Among these tests, electrocardiogram (ECG) and two-dimensional echocardiogram (2D echo) play a major role. ECG of normal pregnancy may reveal a leftward shift of the electrical axis, especially during the last trimester. This is due to upward displacement of diaphragm by the enlarged uterus. In lead 3, a deeper Q wave may be seen. Echo is an invaluable tool for diagnosis and evaluation of cardiac disease in pregnancy. There are increased left ventricular dimensions that are normal in pregnancy and a progressive mild dilation of all cardiac chambers in diastolic without any change in end systolic. The increase in blood volume and cardiac output is responsible for dilatation of heart and eccentric hypertrophy that are reversible after delivery. Left ventricular end-diastolic dimensions increase slightly during pregnancy. Left ventricular mass increases by 5 to 10% during pregnancy and reverts to normal by 6 months postpartum. The atria may be dilated to some extent. In 40% of normal pregnant women, there is mild pericardial effusion in the last trimester. Therefore, many cases of mitral stenosis are diagnosed in pregnancy by echo. 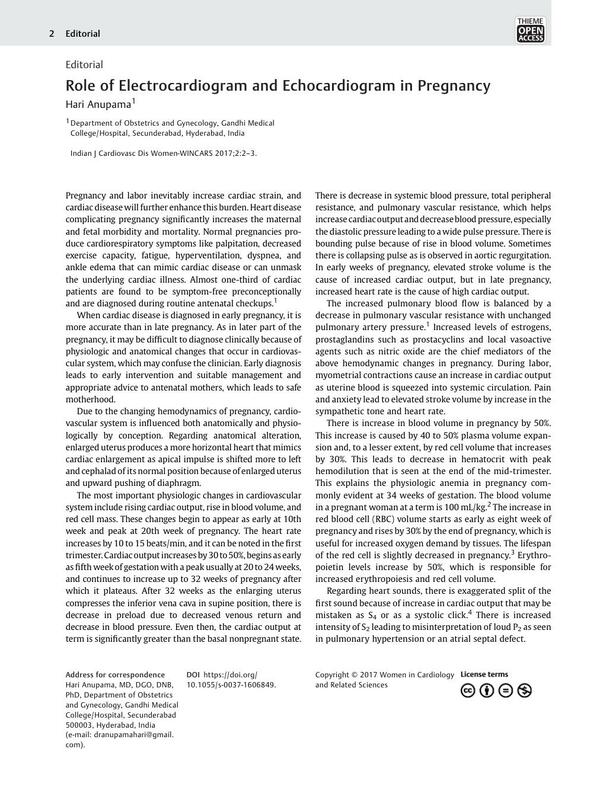 As cardiac diseases in pregnancy are an important cause of maternal mortality and morbidity both in antepartum and postpartum periods, the efficiency of the cardiologist to make a definite diagnosis and management of cardiac illness and of the obstetrician to manage the delivery in time leads to better obstetric outcome. The obstetrician must ensure that cardiac patient is closely supervised and that extra demands of pregnancy are met satisfactorily so that the cardiac status does not deteriorate during pregnancy. In this issue, two case studies of ECG and echo of antenatal mothers are presented further highlighting these important issues.